With their reputation for welcoming visitors and their unique cultural footprint, the countries of Central Asia will remind you why you travel. This comprehensive 23-day tour will take you through all the 'Stans we visit, offering a fascinating glimpse at a beautiful part of the world most travellers miss. Stay at unique homestays, sleep in traditional yurts, discover the breathtaking mountain and desert scenery, enjoy free time in the Uzbek city of Tashkent, and roam gorgeous buildings built centuries ago. See Central Asia with a group of like-minded adventurers and an expert Chief Experience Officer (CEO) and cross off an entire and unexpected region of the world from your must-see list. Local Living: Overnight in a Yurt, Aydar Kul Camp. City tour (Almaty). Charyn Canyon stop. Karakol city tour (half-day). Yurt building presentation (Kizil Tuu). Felt-making workshop visit. Community-based tourism (CBT) stay. Burana Tower visit. Half-day city tour (Bishkek). Dushanbe city tour. Hikes and picnic lunch. Mug Teppe settlement visit (Ura-Tube). City tour (Khujand). Khujand market visit. City tour (Tashkent). Orientation walk (Samarkand). City tour including a Registan visit. Nurata Shrine visit. Alexander the Great fortress visit. Desert yurt stay (Aydar Kul). Guided walking tour (half-day, Bukhara). Walking tours (Khiva). Internal flight. Transport between destinations and to/from included activities. Group Size Notes: Max 16, avg 12. Meals: While traveling with us you will experience the vast array of wonderful food available in the world. Generally, to give you the maximum flexibility in deciding where, what and with whom to eat, not all meals are included in the trip price. This also gives you more budgeting flexibility. As a rule our groups tend to eat together to enable you to taste a larger variety of dishes and enjoy each other's company. There is no obligation to do this though. Your CEO will be able to suggest favorite restaurants during your trip. Please check the 'meal inclusions' section below for details of meals included. Transport: Private vehicles, plane, train, walking. 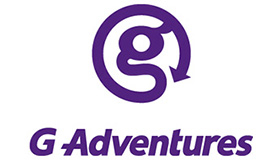 Minimum Age: You must be 18 to travel unaccompanied on a G Adventures tour. For minors travelling with a guardian over 21 years old, the minimum age is 12. Take a city tour of Almaty including the historical centre, the Zenkov Cathedral and the Monument of Independence. Enjoy a free afternoon to explore. Opt to climb green hill for a panoramic view or visit the local market. Drive via scenic Charyn Canyon to take in more of the Kazakh landscape. Reach the border and cross into Kyrgyzstan. Enjoy an evening in Karakol. Visit the Prejevalskiy Museum then drive to Kizil Tuu. Stop en route for a swim in the lake. In Kizil Tuu learn how to built a yurt before continuing on to Kochkor. Visit a felt-making workshop to learn more about this typical Kyrgyz craft. Opt to pick up a carpet or two. Continue on to the scenic Song Kul area and stay overnight in a traditional yurt for a true cultural experience. Spend a full day soaking in this beautiful area. Opt to head out for some hiking or horseback riding. Enjoy another night in a yurt. Continue on into the scenic valley of Chong-Kemin. Stay in the local CBT (community based tourism) houses and explore the village. Soak in the stunning scenery. Depart Chong-Kemin and stop at one of Kyrgyzstan's oldest sights, the Burana Tower. Learn more about the ancient structure (rare in a nomadic culture) before continuing on to the capital city of Bishkek for an afternoon city tour. Board an evening flight to Almaty. There is plenty of time to explore the artisan shops and wander the narrow twisting streets and alleyways. A centre for pottery, cloth, and Turkmen carpets, the Old City is centered around Lyabi-Hauz, a delightful pool of water surrounded by ancient mulberry trees, where you can sit at caf? tables and let the evening drift by. There is also the option to take in a local puppet show held in an old caravanserai or indulge in a Turkish bath. Arrive back in Tashkent and enjoy a city tour or explore on your own with some free time.